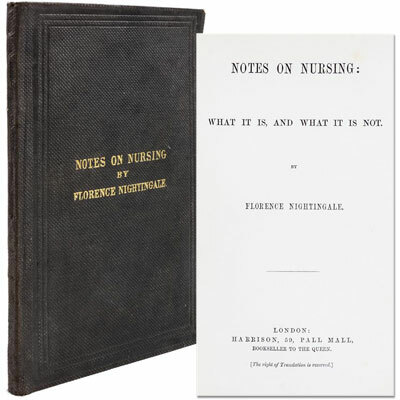 Florence Nightingale’s seminal work of nursing – the first of its kind ever to be published – which sets out her principles of care for the sick and injured, with advice and practices under chapters entitled ‘Observations of the Sick’, ‘Personal Cleanliness’, ‘Bed and Bedding’, ‘Cleanliness of Rooms’, ‘Taking Food’, ‘Ventilation and Warming’, and ‘Health in Houses’. ‘The book was the first of its kind ever to be written. It appeared at a time when the simple rules of health were only beginning to be known, when its topics were of vital importance not only for the well-being and recovery of patients, when hospitals were riddled with infection, when nurses were still mainly regarded as ignorant, uneducated persons. The book has, inevitably, its place in the history of nursing, for it was written by the founder of modern nursing’ – Joan Quixley, head of the Nightingale School of Nursing, 1974. References: Skretkowic, Florence Nightingale’s Notes on Nursing and Notes on Nursing for the Labouring Classes 431-441. 8vo (14 x 21.5 cm). pp. 79 . Publisher’s beaded charcoal cloth over stiff card boards, upper cover titled in gilt, publisher advertisements to pale yellow endpapers. The first version of the book printed from the original setting of type was published in the first week of January 1860. In two months at least 15,000 copies had been published to sell at the price of two shillings. According to Dr. Victor Skretkowic’s detailed notes on identifying the first edition, due to the lack of dating on the title page and the considerable variations of binding and typographical states, early copies are almost impossible to accurately identify.